Feel free to use this power point and change it as you need it. Please however give credit to me (Sandra De Groote) as part of your document or powerpoint. The h-index is an index that attempts to measure both the scientific productivity and the apparent scientific impact of a scientist. The index is based on the set of the researcher's most cited papers and the number of citations that they have received in other people's publications (Wikipedia) A scientist has index h if h of [his/her] Np papers have at least h citations each, and the other (Np − h) papers have at most h citations each. There are various tools and methods upon which to measure the impact of an individual or their scholarship. h-index: The h-index is an index to quantify an individual’s scientific research output (J.E. Hirsch). There are several databases (Web of Science, Scopus, and Google Scholar) that will provide an h-index for an individual based on publications indexed in the tools. Find about more about these tools and how to use them by clicking the Find Your H-index tab. Citation Analysis: Is the process whereby the impact or "quality" of an article is assessed by counting the number of times other authors mention it in their work. UIC has access to a number of resources that identify cited works including: Web of Science, Scopus, and Google Scholar. Find about more about these tools and how to use them by clicking the Citation Analysis tab. Altmetrics: Altmetrics is a quantitative measure of the quality and quantity of attention that a scholarly work is receiving through social media, citations, and article downloads. Find out more about Altmetrics and tools for obtaining altmetrics data, click on the Other Metrics/ Altmetrics tab. Impact Factor: The impact factor is a measure of the frequency in which the average article in a journal is cited in a particular year. Impact factors measure the impact of a journal, not the impact of individual articles. Find out more about the impact factor and tools that measure/ rank journals within specific disciplines, click the Journal Impact Factor tab. The process whereby the impact or "quality" of an article is assessed by counting the number of times other authors mention it in their work. Citation analysis invovles counting the number of times an article is cited by other works to measure the impact of a publicaton or author. The caviat however, there is no single citation analysis tools that collects all publications and their cited references. For a thorough analysis of the impact of an author or a publication, one needs to look in multiple databases to find all possible cited references. A number of resources are available at UIC that identify cited works including: Web of Science, Scopus, Google Scholar, and other databases with limited citation data. Citation Analysis - Why use it? To find out how much impact a particular article or author has had, by showing which other authors cited the work within their own papers. 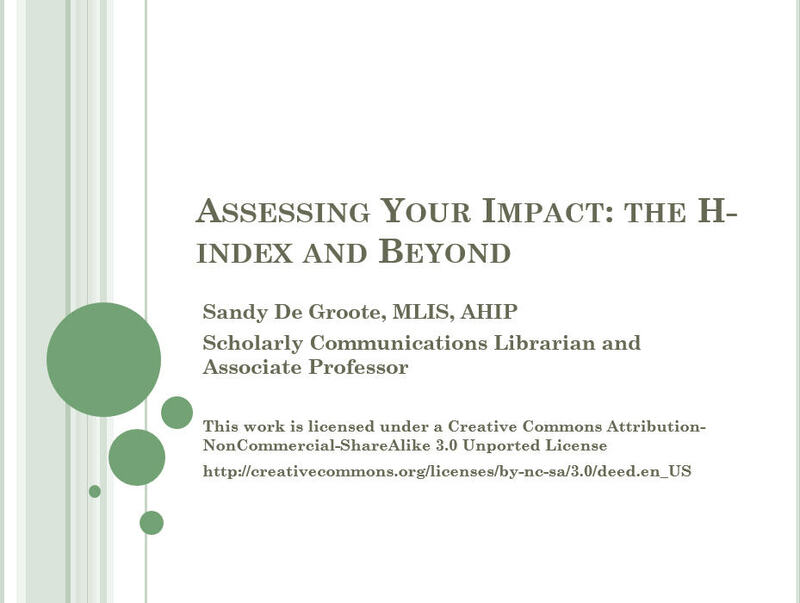 The H-Index is one specific method utilizing citation analysis to determine an individuals impact.